Perfect for Succos, this gourmet-tasting soup packs in loads of flavor, enhanced by the delicious bits of meat that accompany every spoonful. In a food processor fitted with the knife blade, chop half of the button and baby bella mushrooms into small pieces. Switch to the slicer and slice remaining mushrooms. Combine all in a bowl and set aside in the refrigerator. In a large pot, sauté onion in oil until golden; add flour and continue to sauté until flour begins to brown. Add meat and brown, stirring continuously. Add water and bring to a boil. Lower heat and simmer for one and 1/2 hours. 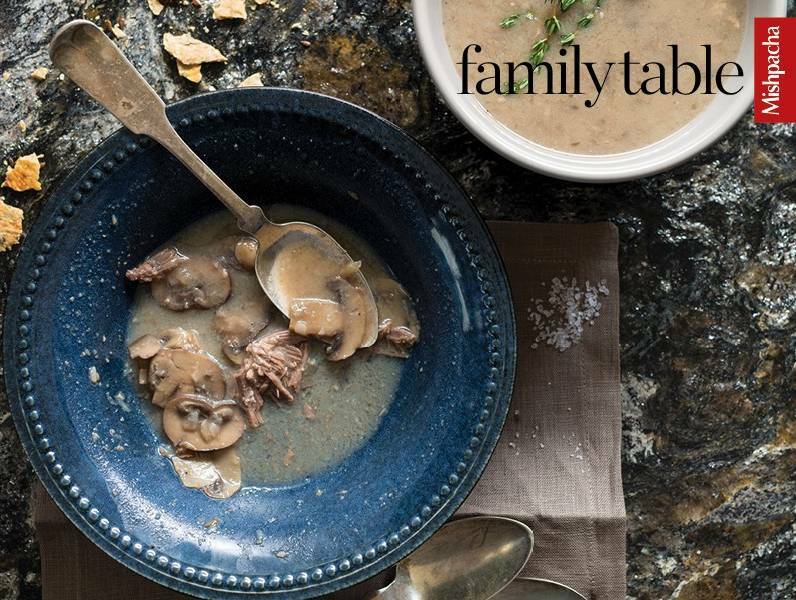 Add mushrooms, mushroom soup mix, sherry, brown sugar, and seasonings to the pot, and cook on low flame an additional hour, or until meat is falling off the bone. Remove flanken from pot and shred meat, discarding fat and bones. Return meat to pot. Add soy milk to soup and heat through.